All municipal offices closed, Lexpress does not operate, compost facility closed, trash & recycling collection delayed, all Lexington Schools closed. Cary Library will be open Saturday and Sunday, May 24 and 25 but closed on Monday May 26. There will be wreath laying ceremony, a parade, and Battle Green ceremonies on Monday, May 26. First Congregational Church, 62 Centre Street, Nantucket. A program of European cabaret and American musical theater songs-with vocalist Susan McGinness and pianist Robert Behrman. Time : 4 p.m. 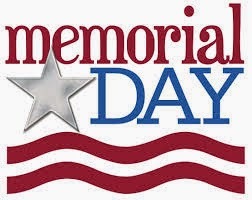 Enjoy a Safe and Happy Memorial Day Lexington!